With last night's win over the Utah Utes, the University of Washington Huskies go to 2-1 on the season. This game was significant because it was the Huskies' first in-conference game and it was on the road. Last year the Huskies had problems on the road, their only two losses coming when away from Husky Stadium. At first the game looked like it might be a blow out. The Utes went three-and-out on their first possession and then the Huskies made a touch down on a Myles Gaskin run on their first play. But after that it turned into a defensive battle which kept both scores fairly low. The final score was 14-7. The Huskies looked better than they did against North Dakota. But they still have to figure out the run game. Gaskin only made that one opening long run, and had a lot of runs that went almost nowhere. We have a new Offensive Coordinator this year and I'm wondering if that's part of the problem. He doesn't know how to use Gaskin effectively. Also, for some reason, Salvon Ahmed only carried the ball once in the entire game. And he didn't get far, either. I spent the entire summer saying "Ahmed is going to be so good this year" and so far, he hasn't lived up to my hopes. How dare he? Jake Browning's throwing game is looking better, too. The biggest problem the senior has is he still tries to make plays he just can't make and as a result, gets sacked way back. He needs to know when it's over and fall on the ball. He also got called for intentional grounding once (and I thought it should be twice). The Utes' defense had two targeting calls against it. One was blatant and the other was a bit questionable. Targeting is when the player leads with his helmet for a tackle. But two Utes were ejected from the game. I bet the Utes' fans will be grumbling about the officiating for two weeks (they have a bye next week). Eastern might do better ,but the score was 24-59. USC got tounced by Texas 14-37. That puts USC 1-2 on the season. They may not be the Pac-12 South champion. Right now the Colorado Buffaloes are in first place in the Pac-12 South at 3-0. Stanford and Oregon lead the Pac-12 North at 3-0. 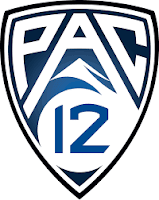 So we definitely need to beat Stanford and Oregon to win the Pac-12 North. One team that's having a tough time is UCLA. They are 0-3 and lost yesterday to Fresno State (a former cupcake). UCLA has a new coach (as do five Pac-12 teams) but if this keeps up, he won't last long. By the way, the teams with new coaches are Arizona, Arizona State, UCLA, Oregon, and Oregon State (who stole the Huskies offensive coordinator to be head coach). But it's early in the season. Only Stanford, Washington, the Utes, and USC have played in-conference games. And only Stanford and Washington have in-conference winning records (of 1-0). We'll have to see how things shake out when there's more conference games in the record books. The AP Top 25 football poll has Stanford climbing to #7 from #9. Washington stays at #10. And Oregon stays at #20. USC and Arizona State drop off the top 25. So now only three teams in the Pac-12 are in the AP Top 25. The top four positions are #1 Alabama, #2 Georgia (up from #3), #3 Clemson (down from #2), and Ohio State #4. And finally, Auburn (who we want to do well now) lost to LSU, so Auburn dropped to #9 and LSU jumped to #6 (from #12). Now we just wait a week for the next college football Saturday.